Can you create and print a project directory without cutting and pasting to a word processor document? Can you view in real-time how much time has been charged to your project? Can you quickly find correspondence from a project 5 years after completion? You can do all of this and more with AIM. 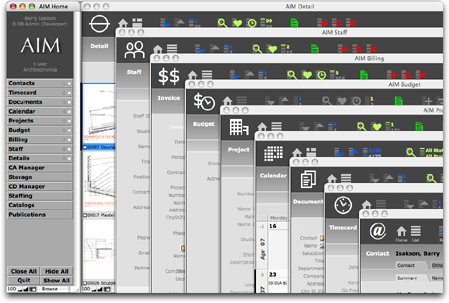 AIM is a tightly integrated set of tools for managing every aspect of your projects and practice. Built on the FileMaker® Pro database application, AIM will help streamline your workflow by centralizing many diverse aspects of your practice in a single place. AIM is a modular system with very flexible licensing. Each module can be purchased separately. Buy only what you need when you need it. Start with a single module and a few seats then add more modules or more seats as the need arises. AIM has a consistent, easy-to-use interface with a relatively short learning curve. Once you have learned the basic commands for one module you know them all. In addition, the interface can be simplified for a each group of users by hiding modules and tabs users do not need to see. Security within the AIM system is customizeable for each group of users. You can control whether each group of users can create, edit, delete, export, print, etc. separately for each module. Please click on the links to your right for detailed descriptions of each module. Copyright © 1989-2007 Architectronica. All rights reserved. Architectronica is an independent entity and this web site has not been authorized, sponsored, or otherwise approved by FileMaker, Inc.